SNEAKER: UP, UP & AWAY! I have never broken a bone or had a stitch. I am a cautious person and try not to put myself in physically risky positions. Along those lines, I never thought jumping out of a perfectly good airplane made any sense. 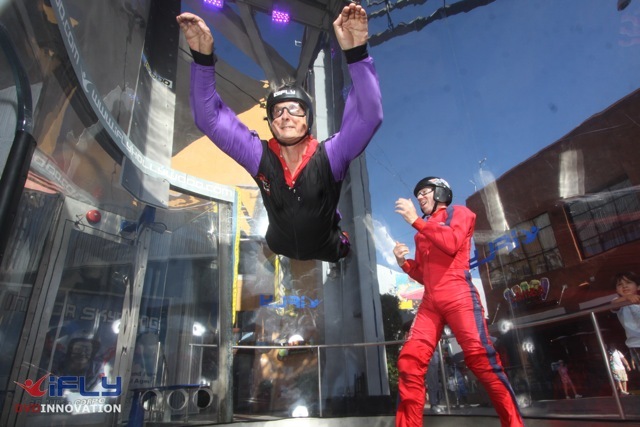 My son had tried indoor skydiving and showed me pictures. While it looked like fun, I thought it was out of my comfort zone. Then again, maybe it would be good to push myself a little further physically in a situation that really didn’t present real risk. It was a great experience to do something new (whoever said that line about “old dogs” didn’t know what they were talking about) and was a great adventure that will push me to try other things that are outside of my natural comfort zone. As long as they don’t involve jumping out of a plane. I’m a planner. Now, when I say “planner,” I don’t mean that I choose what I’m going to wear the night before and lay it out so it’s all ready in the morning. I have calendars and lists and notes on footnotes to those lists and calendars. If something is going to happen in my life, it is usually scheduled out well in advance. Spontaneity is NOT my middle name. My husband and I are living overseas, and we found a website with last minute deals to European destinations. “Last minute” can sometimes mean that you have about three hours to pack up and get yourself to the airport. So on a Thursday night when my husband asked if I wanted to spend the weekend in Prague, I knew that this was the perfect opportunity to get my sneakers dirty. We booked our tickets. By the time we got our confirmation from the airline, it was just over 24 hours before we would be leaving for the airport. How was I going to be ready in that little time? What about all the things I already had on my list and my calendar? The truth is, it was all fine. I spend a few minutes sending some emails to move a few things around, and the world didn’t stop. I packed a backpack (a tiny one!) with three shirts, some underwear and socks, and a pair of pants. I grabbed my camera, and we were off. I didn’t have time to worry about if I had exactly the right clothes and shoes for each and every kind of situation I might find myself in. In fact, it was literally just me and my sneakers. We had a fantastic trip. To be honest I did buy a guidebook and do a little reading and preparing of all the things that we would see and do, but I realized that it was ok to jet off to a new city for the weekend without a plan of exactly what we would see, do, and eat at every moment of the day. We had fun. Tons of fun. When we came home three days later, I realized that my once-white sneakers were actually dirty. Sneaker Story: Close Your Eyes and JUMP! They didn’t take my picture. There I was, 12-years-old and flying through the air, my little hands holding onto the swinging bar for dear life, then letting go as I was lowered into the net…and they didn’t take my picture. WHEN was I going to do that again? I wouldn’t be going back to camp, and there weren’t many flying trapezes in the real world. True, I didn’t do it full out. I didn’t let go and hang from my knees and trust someone to catch me as I untangled myself from the bar. But still! That was a big moment! When I think about doing it now (as an adult) and I picture myself flying through the air, feeling such utter freedom andassurance that I can let go and will be caught… it seems impossible. To let go and soar would be a miracle in my world! (Both literally and physically.) 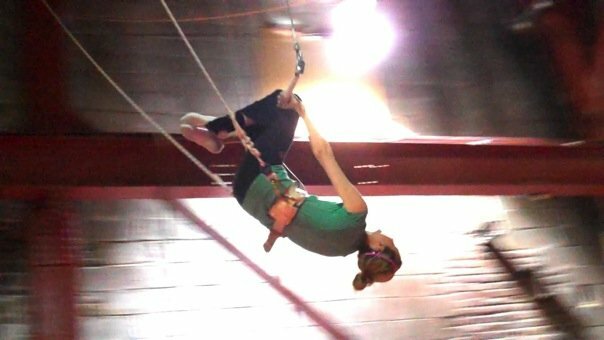 Well, it happens I live in a city that offers flying-trapeze classes. 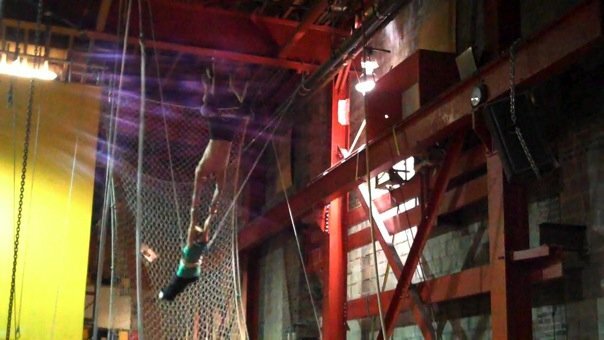 So here’s the deal: I will let go on a flying trapeze. As an adult. I’m actually doing this. In a few hours, I’ll be sailing through the air. I’m thrilled and terrified. For as long as I can remember, I’ve wanted to fly. Whenever kids played “what superpower would you have?” I always chose the ability to fly. Holding onto a bar and flying through the air would be a dream come true. However, the anxiety-ridden part of me ignores these marvelous images and focuses on the negative: My core and arm strength leave much to be desired, so the thought of hanging by my arms and tucking my legs over a bar is disconcerting—and what if I’m the only one in class who can’t do it? How embarrassing! Furthermore! Then there’s the issue of having the fortitude to let go, especially while flying through the air. That alone is a huge relinquishing of control. Yes, I’ll be in a harness, but I still have to trust I’ll be safe. Reaching out to catch my instructor and letting go of the bar is a HUGE leap of faith (no pun intended)— that he will catch me, that I will catch him, that the timing will work out. So I’m going to have to do all I can to focus and make it happen. My biggest concerns are trusting I can do this—and believing I won’t hurt myself if I do. I’ve never been this petrified. 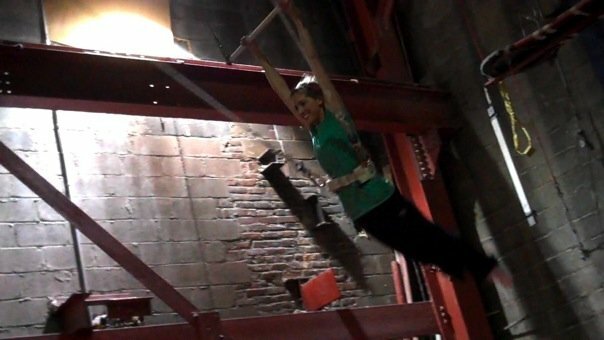 Stretching in the trapeze studio, I look at the monstrous contraption in front of me. The platform is 20 feet off the ground. Underneath, there’s a five-foot squishy mat. As I look up the tiny ladder we’ll climb, I feel a little sick. Jay, one of three beautifully sculpted instructors, guides us to a static rig, basically a trapeze bar on the ground. He shows us how to grip the bar, put our legs over it, let go, hang upside-down and look back with arms outstretched. My panic rises. It looks like you really need arm and core strength—neither of which I possess. I let go and hang okay, but Jay needs to help me back up. He explains that the static rig is more difficult than the flying one, where momentum helps. He tells us we’ll swing upside-down with arms outstretched then catch one of the instructors (or really, he’ll catch us). But we won’t be doing that until the end. Mostly, we’ll practice backflips off the bar. I must be making a “you’re out of your mind” face, because Jay sees me and cracks up. He assures me it will make sense in the moment. Taking the phrase “high anxiety” literally. And then…I’m flying. I’ve done it! Look! I’m smiling! And FLYING! I don’t have long to enjoy the sensation, as below, Chase, the third instructor, is telling me to lift my legs for the knee tuck and wrap at the top of my swing. I try but don’t have the strength—my knees don’t make it up. I keep swinging, and Chase keeps shouting instructions, and I can’t do any of them! He lowers me, and I slink off, giving my “I’m just not strong enough” excuse. Chase says flying has nothing to do with strength—it’s all momentum and timing. I have to stop thinking and just do it. Ha! If only he knew how hard that is for me! He shows me what to do with my body to get the knee tuck to work, then I go to my chair, embarrassed. I watch the class do it again, one by one, flawlessly. Then I’m up. This time, I’m calmer, determined to make it work. “Hep!”—I’m off in the air again! I follow Chase’s timing precisely. And guess what? I nail every move! Perfect knee tuck, perfect release and upside-down stretch, perfect back-flip! When I hit the mat beaming, everyone bursts into applause. I repeat the routine and nail it again! The terror is still there but decreasing each time. The best part is that at the end of each turn, I have no recollection of what I did because I was so in the moment. That has NEVER happened! I’m beginning to feel really good when Todd announces we’re going to do catches, the part I was dreading. I wait my turn, take my swing, and miss my knee tuck. Again, I‘m back in my head, and my body doesn’t do what it’s supposed to. Luckily, we have time to try once more. I want this so badly. I want to know I can push myself past my limits and let go. So, off the platform I jump, through the air I sail, and around the bar I wrap my knees. At the top of my swing, I reach out and feel Todd’s hands grip my wrists as my legs release the bar. The entire studio cheers as I soar through the air holding onto Todd. Then he releases me, and I land exactly as instructed. I could not have a bigger smile as Chase says I’ve earned my wings. Jay says he knew I could do it, the whole class knew. I was the only one who doubted myself. He caught me! I let go and he caught me. Amazing! EXPLANATION: I avoid doing this at home, at work, at conferences, at social gatherings. I lose sight of the point, and thereby my motivation. I lose sight of the bigger picture and get mired in day to day tasks. I lack confidence in my knowledge. I am naturally introverted. I cannot, under any circumstances, no matter how much in a hurry I am, drive on the freeway or highway. It always seems to me that everyone driving behind me is chasing me. To catch me. For what reason? Can’t figure that out. It just feels that I have to drive faster and faster to get away from the other drivers. It gets worse. I have no patience with people who don’t drive well – or, at least, don’t obey the law. So as I am driving to get away from the people who are chasing me, and am already anxious, I get mad when drivers change lanes without signaling, drive while talking on the phone, cut me off to make turns while honking angrily – you get the idea. Somehow, when driving on streets, with everyone in slower motion, I can deal with the thoughtlessness of others, since the resulting danger would be easier to avoid. And the stop and go traffic makes the whole process more human. Hard to feel that someone is chasing me when they are driving 35 miles an hour, and stop and go to get there. I cannot spend my life taking an hour to get to my destination which is, in reality, only minutes away. It is inconvenient. It is silly. And it is becoming increasingly difficult to explain to others why I have to leave so early to get someplace, or why, when I drive a friend somewhere, I can’t take the highway. I am not a child. But I feel like one when it comes to living in a world where it is nearly impossible not to, at some time during the day, drive on a highway, and I can’t do it. I resolve to do it. My methodology seems so obvious to me – get on the freeway, and just drive to the next exit, and then get off. Do that several times. Then drive past and exit at the second exit. Get off. And I decide that at the same time I am driving, I will listen to my favorite, most soothing music , a song I love more than any other, a piece which makes me smile and gives me peace. And I promise myself that I will make up stories for the other drivers, ones which do not include car chasing, but rather personal voyages which make sense to me. Am getting into the driver’s seat. Seatbelt on. CD goes in – the song: Judy Garland (or Katherine McPhee) singing “Somewhere over The Rainbow”. Breathe. OK. Breathing. Start the car. Drive to the freeway entrance. I pull over. Breathing again. Judy is singing, “Bluebirds can fly.” Yup, I think, so can I.
I get on the onramp. Push on the gas pedal, harder and harder. Make it up the ramp to 45, then 50. Signal as I get into the left lane. Am up to 60. I see the cars behind me. “Nope”, I tell myself “. That lady is not chasing me. She has a baby in an infant seat, so she is taking that baby to music class. She is no hurry. She is just intent on getting there. Safely. She moves up alongside me, and as I glance at her, she is singing, probably to her baby. As she passes me, she signals. OK. Good. I can do this. I get off at the next exit, as she does, and pull over. That was not so bad. I decide to get on again, this very minute, and try for two exits. I am now doing 65. Cars are still passing me (that man with the cap over his eyes – he is on his way to a baseball game, I am sure, and he is hoping to catch a fly ball), but I don’t care. They are not chasing me – I seem to be chasing them. Instead of watching them for signs of hostility, I see people rushing to get home. I see blue skies. I change lanes (signaling of course) realizing that here I am, 31, and this is the first time I have actually changed lanes at 65 miles an hour. And I am fine. Smiling, actually. I pass others, and some still pass me. But my hands are not clenched, and my heart is not pounding. OK. I guess you can say my sneakers are scuffed. Not filthy, but scuffed, nevertheless. First step – a big one for me. Next time, I am actually going to make it to the beach. Ten Exits. No problem. EXPLANATION: I find that I am so caught up in being afraid of being under prepared and terrified of having to “wing” anything, that I spend far too much time over-preparing to make sure everything is PERFECT before it ever sees the light of day. While this means that I present a good face to the world and impress people with my skills and professionalism, it also means that I am frequently exhausted with far too little free time. I need to learn to find a balance and trust that simply “preparing” is enough. I’ve never been a naturally outgoing person. I’m not inclined to strike up a conversation or initiate a friendship. But I actually realized, years ago, that this was something I could change. I’m in my mid-thirties now, and still using and refining a Sneaker moment that happened when I was just 9 years old. I’m packing for a week at sleep-away camp, the summer before 5th grade, when I suddenly have a Eureka moment. No one at this camp knows me. They don’t KNOW that I’m shy. So I could just show up and ACT OUTGOING, and people will think I’m outgoing. If the experiment failed, it would sure be a looong week. But there would be a light at the end of the tunnel: camp would end and I’d never see any of these people again. So I decide to give it a shot. The girl smiled back, and was one of the many new friends I made that week at camp. It’s been 25 years, and I’m still not a naturally outgoing person. But I remind myself before every networking event and professional cocktail party to “get my sneakers dirty,” by acting outgoing. I’ve helped my career (and my husband’s) immensely due to my apparent outgoing personality at work-related functions. And I’ve made friends and real connections with others, especially with shy people. As a shy person myself, I know exactly how they feel, and how nice it is when an extrovert walks right up and introduces herself. “At 12 blocks away, I feel that first drop. It’s just a gently misty sprinkle at first, no big deal. My friends and family used to joke that I thought I was the Wicked Witch. It wasn’t my evil cackle or my threats to Toto that earned me the nickname, it was my mad dash for the nearest indoor spot the second a drop of moisture fell from the sky. To this day, I always check the weather report before I leave the house just in case there is a chance of rain. If there is, I will take the time to shove my umbrella into my bag and make sure I have the appropriate rain-proof shoes and attire. I once read a quote by Roger Miller that said, “Some people walk in the rain…others just get wet.” I did neither. I either ran for cover under the temporary shelter of my umbrella, or I just didn’t go out. But secretly, I always envied the people I saw walking down the street who were drenched to the bone and smiling. I didn’t understand them, but I envied them. So here’s the deal: I will walk in the rain without an umbrella. I am walking back from meeting a friend 15 blocks away from my apartment when the wind picks up, the sky lights up, and the earth rumbles. I start walking a little faster. At 13 blocks away, I can barely keep my eyes open through the howling wind blowing the city’s dirt and grime in every direction. At 12 blocks away, I feel that first drop. It’s just a gentle misty sprinkle at first, no big deal. Except that I left my umbrella at home. So I walk a little faster. 11 blocks…a few more drops. 10 blocks…a few more. At eight blocks, it happens. The sky opens up and it starts to pour. People are scattering on all sides. Bus boys are rapidly trying to gather the outdoor seating tablecloths. People under umbrellas are desperately trying to hail passing cabs. And I have eight blocks to go, and no umbrella. 3) Walk in the rain. I’m not sure what comes over me at that moment, but my feet seem to make the decision for me. They just keep walking. Every step I take brings me to another level of “drenched” that I never knew existed. My blue denim capris are now almost black and desperately clinging to my body, my hair is flat down against my head and sticking to my face. I don’t even want to guess what my non-waterproof make-up looks like, and I’m pretty certain my two layers of white tank tops are now giving the world a totally unintended show. And yet, I don’t melt. In fact, something quite miraculous happens. As I walk by people huddled under awnings or sprinting through crosswalks and I see their expressions as this poor, soaked girl walks by, I start to laugh. I know I can’t get any wetter and since I’m not melting, I just break out into a smile…and walk in the rain. With this walk comes a freedom I have never felt before! I am no longer the girl who freaks out when her hair gets wet or screams like a teenager when a puddle splashes near her. Just by doing all of these seemingly simple (but until recently insurmountable) challenges, I have learned to let go. I may look like a crazy person with smudged make-up and a see-through outfit with a big smile on my face, but I just don’t care. In fact, I kind of like it. When I get home and survey the damage, I look down and start to laugh even harder. Turns out, for the first time in many months, I am wearing sneakers. And for the first time in my life, they are truly dirty! Congratulations on choosing to participate in The Sneaker Experiment©! Everyone is at their own step in their readiness to take that first step, and that’s totally fine! If you’re just here to read other people’s Sneaker experiences, that’s okay! You’ll join us on your own journey outside of your comfort zone when you’re ready. You may be ready to create your own list today. Great! Please share it with me and I’ll share it with the rest of our readers so that they can give you support on your journey and possibly get inspired to create some list items of their own! Today might be the day where you actually take that first step toward conquering one of your Sneakers! If so, congratulations! I know it sounds trite, but it really is the hardest part. Please tell us what happened when you tried that first item on your list! You might be a veteran of the Sneaker Club who has conquered and perhaps shared many of your own Sneakers. If so, welcome back and thank you for sharing! Whoever you are, I’m so happy to have you here! Now, let’s get our Sneakers dirty! WHAT IS THE PURPOSE OF THE SNEAKER EXPERIMENT© BLOG? This is not an advice blog, nor is it a blog that is all about me and my thoughts about life. The purpose of this blog is to connect a community of people who are all taking part in The Sneaker Experiment©, and who will benefit from reading about each other’s experiences while participating or preparing to participate in this movement. It is a home to return to again and again as we continue to blaze through our own personal Sneaker Lists.